Paul Jay, senior editor of RNN in Baltimore, interviews Roy Singham, a cofounder (with Swartz) of Thoughtworks (link), and Brian Guthrie of Electronic Frontier Foundation (link) . They described Swartz’s development of Reddit (link) to Conde Naste for relatively little. But most of the video deals with the apparent federal prosecutorial overreach by Carmen Oritz in Boston. Swartz was indicted by the "fibbies" in 2011, well before he would help lead the political opposition to SOPA (Stop Online Piracy Act). He had apparently written a script to download rapidly a very large number of documents from JSTOR at MIT. It is difficult to see how this is a “crime”, but some have written that Swartz violated a “terms of service” agreement. In general terms, it appears that the federal government saw Swartz as in the company of Bradley Manning and Julian Assange, but that idea doesn’t really make much sense when one looks at the facts, as explained here at Wikipedia here. In any case, the government seemed to have a political motive that it could send a message that it would protect “copyright” owners from piracy by P2P, BitTorrent, and various other technologies, but most (or maybe even all) of the documents Swartz downloaded were public documents that institutions had been charging the public for convenient access. The same is true of Pacer, which holds court documents. Swartz might seem to have purposes similar to that of Jimmy Wales of Wikipedia, but he seemed concerned that many original source documents, while technically public, could be kept from lower income people. 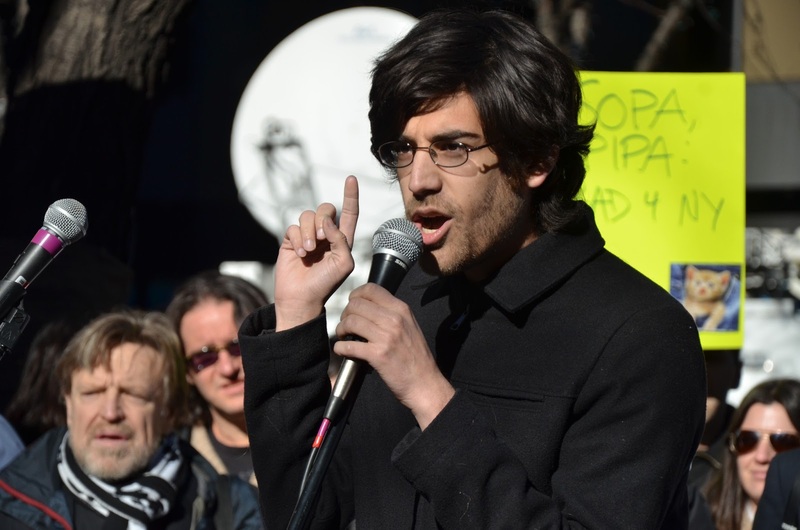 Swartz played a large role in establishing what we call Creative Commons. The video points out that it costs at least $1.5 million to defend against even a frivolous federal indictment to get it dismissed. This prosecution might well have been frivolous and been dismissed eventually with enough legal muscle. JSTOR did not want to prosecute, but MIT had sent mixed signals at best. On January 11, 2013 was found to have hanged himself in his Brooklyn, NY apartment. The video closes with one of Swartz’s speaking appearances. Wikipedia attribution link for picture of Swartz leading protest against PIPA and SOPA in 2012. From the perspective of this blog, this video fits in with recent reviews here about wrongful convictions and prosecutions (Jan. 26, 2013; Dec. 15, 2012). I think a biography of Aaron for PBS (the Independent Lens series or possibly Frontline) or an independent HBO or theatrical film (in the manner of work by Ken Burns, Morgan Spurlock, Amy Berg, or perhaps Michael Moore) would seem like a worthy project. I think this will happen, perhaps for an AFI Silverdocs festival. Maybe I could even participate. In fact, if Aaron were still with us and facing gigantic defense fees, a commercial documentary could be made to raise money for the defense. But people would have to be willing to pay for theater tickets or DVD's, and not just watch a film on PBS or YouTube. That is an irony of this situation. Sometimes people do need to pay for content. There is something also to say about Aaron’s personality, and mention of depression. I have experienced a mindset that believes that “less competitive” people should not attract attention and should keep a low profile until they prove they can directly support (and “protect”) others (personally), because they are beholden to those who supported them. I have certainly experienced that kind of pressure, which is hardly sustainable in the modern world of Internet speech (which, of course, could have been put down by SOPA). “What makes you think you have a valid stake to question us?” is the attitude I get. It’s an idea from those who grew up in a world of social combat. If I got that enough I could want to disappear, too. It's interesting that reviewed Ben Shapiro's "Bullies" today on my Books Blog, about how the author believes the political liberal left bullies or silences opposition. This sad story provides a good example.